Roll with it, baby. Unless you're a pumpkin and then we bake with it, baby. Yes, Baked loves Pumpkin. And so do I. Not sure about pumpkin in cinnamon rolls though. But far be it from me to doubt my Baked Boys. I'm pretty sure they are cool with me calling them that now. We have a connection me and my Baked Boys. Well...I met them...and it was magical...okay, it was a book launch and a new bakeshop opening for them. Yes, I'm a foodie geek. And I met up with some of my pals from Baked Sunday Mornings to celebrate the new book, Baked Occasions, and the opening of Baked Tribeca (the Baked Boys 2nd bakeshop). This was another amazing bit of New York City that I got to experience. I will be sharing that in another post. Baked Occasions-the 4th Baked cookbook! So we (the Baked Sunday Mornings gang), are pretty darn excited to get started on this new book. The Pumpkin Cinnamon Rolls are the 2nd last recipe from Baked Elements, before we get going on the new book. I thought this recipe was pretty simple and fast to pull together. It uses fast acting yeast, rather than the traditional yeast. I don't often make things with this kind of yeast. So I needed to make sure the yeast was still active. Bubble, bubble, toil and trouble. No trouble at all...actually just active yeast. We're good to roll. The dough is made with bread flour. I had an oh-oh moment when I read that. And then a whew moment when I had just enough flour (with a 1/2 cup buffer). Whew indeed. Brown sugar and more spice is needed for the sweet, sweet filling. Oh and some melted butter (and other stuff). Butter makes everything better. Or should I say Buttah! Boo-yah! Yep, my new buttah dish...from my trip to NYC. After a little brushing of butter, these rolls are ready to rock. Baked and ready to be glazed. These are looking good. I may have gone a little Jackson Pollock with the glaze. Seems to be my thing when it comes to glaze. A little coffee, a little roll...life is better Baked my friends. 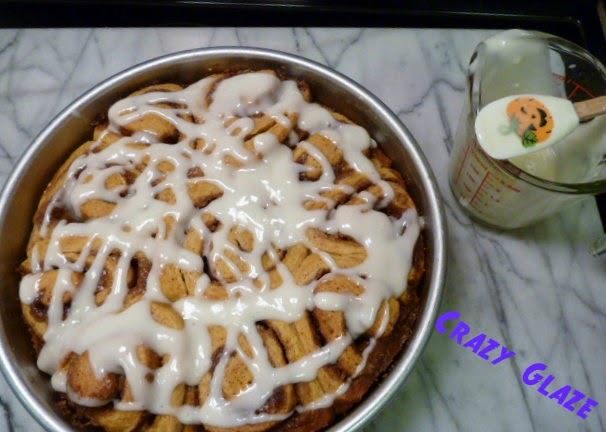 Head over to Baked Sunday Mornings for the recipe and to see how everyone else liked these Pumpkin Cinnamon Rolls. Great meeting you in NYC, Sandra! Your cinnamon rolls look terrific -- like "buttah"! My glaze started out looking like a Jackson Pollock as well, but then I decided to hell with it and I just spread over all of the glaze to cover the entire top of the rolls. How is it that I've never been to Fishs Eddy?! I'm definitely putting it on the list for my next trip to New York! These look great, Sandra! Thanks for all the supportive & wonderful comments you leave on my blog. I SO wish I could have been in NYC with you all! I also wish I could have been in New York with everyone! Your dough seemed to come out much sturdier than mine. It was so soft that I had to add more flour to enable me to roll it out. My carry on was all dishes from Fishs Eddy! (heavy) I loved the store. So great for us bloggers looking for cool things to use in our posts. I can't wait to go back.